Now you have new folders into which you can put your email. But why not have your computer file your email for you? All popular email software – Outlook, Eudora, Thunderbird, Mac Mail and others – let you tell them how to handle incoming email using rules (also known as filters). To try this out, create a rule that automatically files mail from your newsletter subscriptions in your Newsletters folder. Before you begin, make sure you have an email that you want automatically filed in your Newsletter folder. 1) Select the email you want filed in your Newsletter folder. 2) Start your Rules or Filters feature. 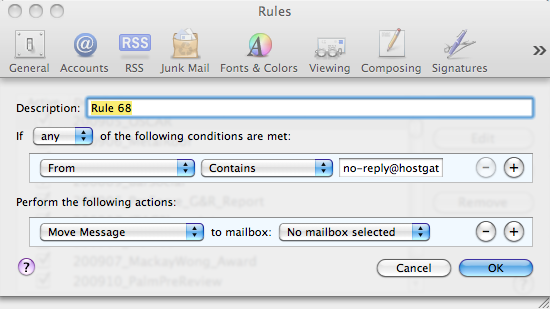 (In Mac Mail, click the Mail menu, choose Preferences and click the Rules tab). 3) Create a new rule. 5) Choose the conditions (criteria) you want the rule to meet. In this simple case, every message that arrives “From” no-reply@hostgator.com will be affected. Mail picks up the email address from the email you selected before starting this process. 6) Choose the action to perform on every message that meets your conditions (criteria). In this case, Move Message to mailbox: Newsletters. Once you create and activate the rule, your email software will automatically file email that comes from the address you specified in your rule. Don’t worry about missing messages. Your email software shows the number of unread messages in a given folder. By creating rules, your email software files messages as they arrive into the folders you designate, which leaves you with less email to clean out of your inbox. If you receive newsletters from multiple sources, you don’t need to create a rule for each source – just add the source to the Conditions list in the Newsletters rule. In the dialog above, you would click the plus sign to the right of the “From” email address. Articles, jokes and non-urgent reading forwarded from friends (especially the friends who mostly send you frivolous messages). Social media notifications (from Linkedin, Facebook, Twitter and the like). Rules have plenty of other uses – just look at the other options in the Rules dialog.